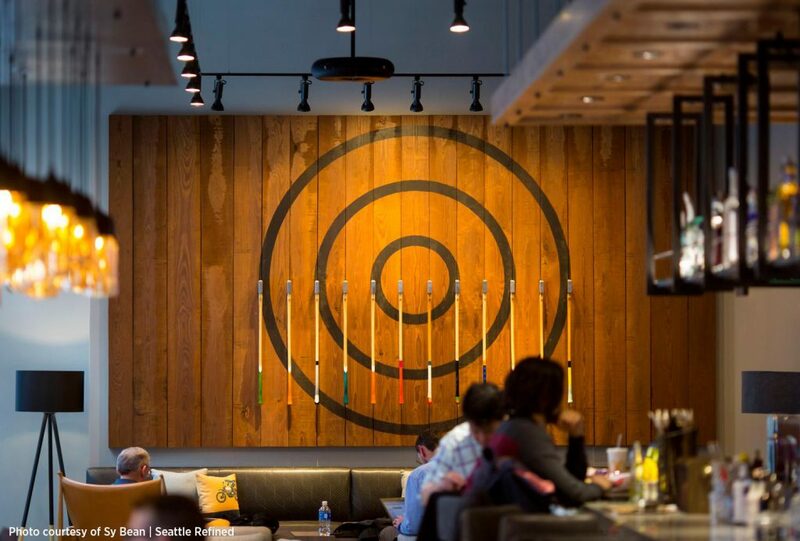 We designed Moxy Seattle Downtown to tell the living story of the city’s past, present and future. You are not in just in any cookie-cutter hotel. At this hotel, you are tapped into the pulse of the Pacific Northwest. So, grab yourself a complimentary “Got Moxy” cocktail and take a seat on the teeter-totter. This is the story of Seattle. Included in Seattle Magazine’s list of 5 Best Hotel Bars in Seattle, they describe the hotel as “a sort of cozy Northwest den theme.” The magazine writes in a second article that Moxy “takes hospitality to new heights,” with playful lobby elements like a reclaimed lumber teeter-totter, crafted by local custom woodworkers, Urban Reclamation.